President Obama, at a high school in North Las Vegas on Wednesday, denounced Republican scrimping on education. Mitt Romney, at an Iowa factory, assailed Mr. Obama over the economy. BETTENDORF, Iowa â" With the unwanted distractions of Representative Todd Akinâs âlegitimate rapeâ comments still swirling in the background on Wednesday, Mitt Romney returned to his main political theme during a campaign stop at the LeClaire Manufacturing plant here â" hitting President Obama over the economy. The president was referring to the various government infrastructure projects that he said help businesses thrive, but the Romney campaign has seized on the remarks as a convenient shorthand to explain why, in its view, the economy is not growing as quickly as it should under Mr. Obamaâs stewardship. But it remained an open question whether the Romney campaign could change the conversation in a race that has been dominated recently by issues like Medicare since Representative Paul D. Ryanâs selection as Mr. Romneyâs running mate, and Mr. Akinâs remarks, which have drawn some unwelcome attention to Mr. Ryanâs own views on abortion. Mr. Obama and his surrogates have eagerly seized on Mr. Akinâs remarks, but on Wednesday the president spent a second day promoting his education credentials, keeping up a combative tone as he shifted focus from higher to secondary education. The president promoted his administrationâs granting of waivers to states from the testing requirements of the Bush-era education law, No Child Left Behind. He said he had tried to allocate federal money to rehire laid-off teachers, but had been stymied by House Republicans, including Mr. Ryan. Speaking to a raucous rally at a high school in North Las Vegas, Mr. Obama accused Republicans of dismissing concerns about crowded classrooms. Mr. Romney, the president said, would impose deep cuts on education financing, as part of what he called the favor-the-rich Republican budget drafted by his running mate, Mr. Ryan. The teacher-heavy crowd of 2,720, packed into a gymnasium draped in basketball banners, was one of the most enthusiastic of Mr. Obamaâs campaign so far. But he was also interrupted by a protester, whose angry questions were drowned out by chants of âFour More Years,â as security guards bundled him out of the room. 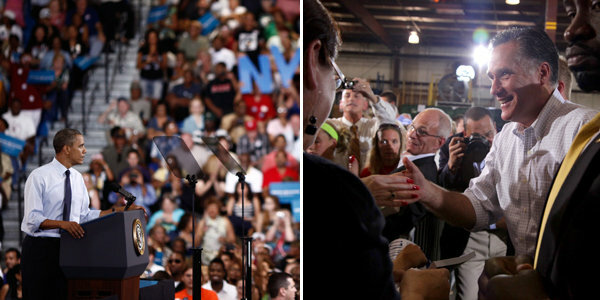 Nevada, where Mr. Obama gave his speech, is one of a handful of states on which the candidates are focusing their heaviest campaigning. Another is Iowa, which, like Nevada, is a state that Mr. Romney wants to return to the Republican column after Mr. Obama won it in the 2008 election. At his appearance in Iowa, Mr. Romney had a short dollop of kind words for the president â" who remains personally popular in the state â" before lashing into what he called his disastrous management of the economy. Mr. Romney is continuing his tour of swing states on Thursday, when he will head to New Mexico, a state that polls show is tilting toward Mr. Obama, to present his plan to make the nation energy-independent by 2020 by opening up more areas to energy development, among other initiatives. But his reception on the trail has not always been a welcoming one. At one point, roughly midway through his speech here on Wednesday, Mr. Romney was interrupted by a heckler. After the event, however, Mr. Romney headed to a private area to do some local television interviews, and the heckler had already left the property, having been escorted out of the event by the local police. Ashley Parker reported from Bettendorf, and Mark Landler from Las Vegas.